Way before college, back in elementary school, I was already a budding science nerd. But my fascination with science was on a larger scale (as opposed to my college focus on molecular and cell biology), leaning more towards things that could be seen by the naked eye, like animals, plants, the rainforest, and fossils. One topic that really captured my attention was outer space. 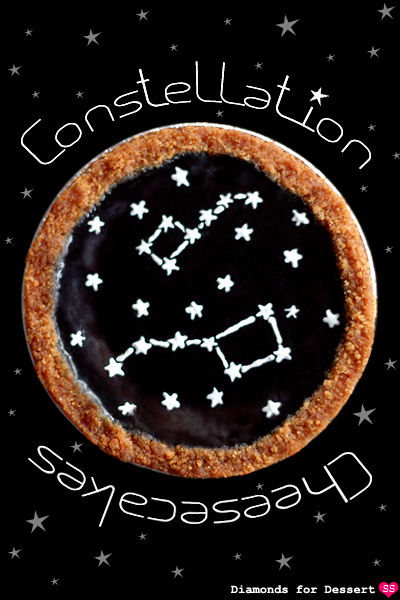 I was obsessed with anything and everything related to it: the stars, the moon, planets, black holes, comets, etc. 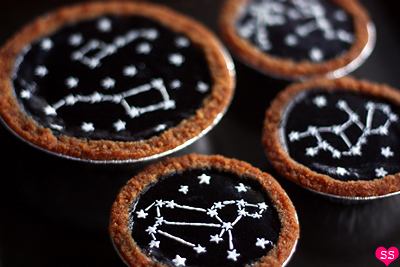 Today's post is inspired by that childhood interest in outer space. Beyond science, stars in particular were interesting to me as they formed bright connect-the-dot images in the night sky, appealing to my visual nature. 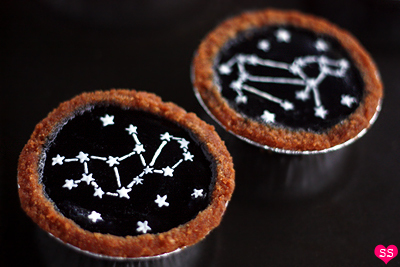 Moreover, tying in Greek and Roman mythology, each constellation has its own story, which made them all the more fascinating. 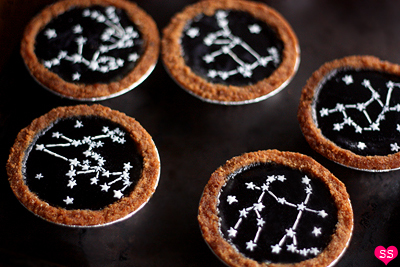 Thus, I really wanted to base a baking project on constellations. 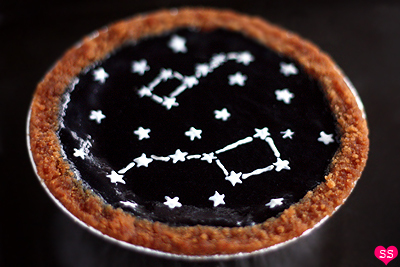 Since blueberries go so well with cheesecake, I thought I could play around with a recipe and make something constellation related with a blueberry glaze acting as the night sky. What I ended up with was this recipe. They're basically simple mini cheesecakes, but instead of baking them in muffin liners, I made them in mini tart pans, forming cheesecake tarts (which also increases the crust to filling ratio, and as I've mentioned before, I'm a crust person). I strained my preserves and added a bit of gelatin to the jam glaze so that it would set smoothly, giving me a flat surface to decorate. 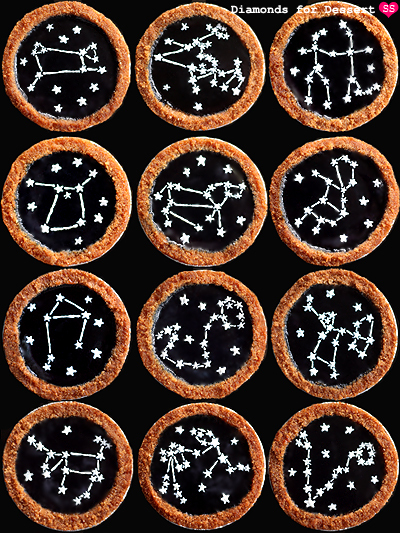 And finally, I made many little white chocolate stars to place on top of each cheesecake in the form of a variety of constellations, completing my constellation cheesecake tarts. Happy (belated) Valentine's Day!!! Thanks to all of you who replied to my facebook post. Your replies were quite helpful for today's post. 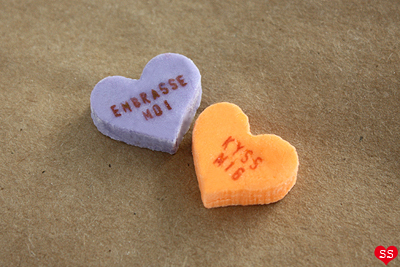 Every year, Conversation Hearts always feature some new messages to keep up with the times. But why stop with just English? 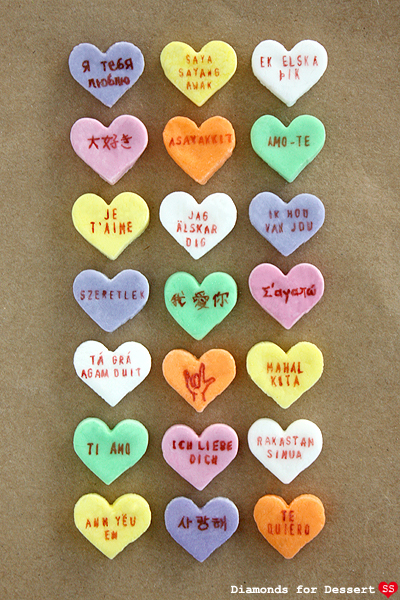 I love learning languages, so I decided to combine that fascination for foreign languages with my Valentine's project for this year. 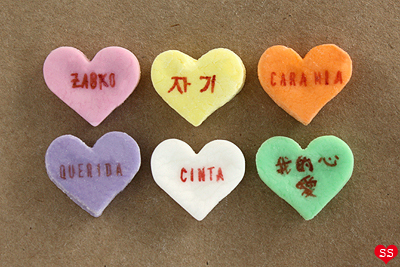 I'm fluent in French and Chinese and I've learned basic Spanish, Italian, Japanese, and Hungarian, so a combination of my own knowledge, the awesome input from some of you, and Google helped me come up with the messages for these Multilingual Conversation Hearts. I first came up with the idea when I noticed the leftover letters from my parents' Do-It-Yourself Stamp Kit sitting in a cabinet, waiting to be used. I saw that in addition to the normal letters and numbers, there were some special character stamps, like Ä, Þ, and Ɖ, and thought it'd be cool to incorporate the stamps into something on this blog. 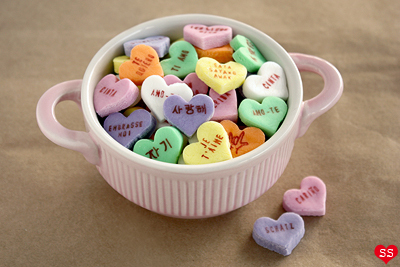 I guess I also had Valentine's Day candy on my mind as well because not long after that, I ended up with this idea. 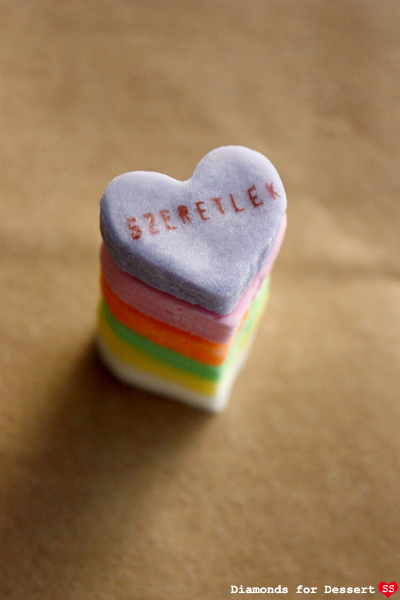 These aren't an exact match to the actual candy, but they're pretty close (they're softer in texture). I can't really judge the taste because I used flavors different from the actual candy flavors (I basically found all the extracts I have and used one for each color). 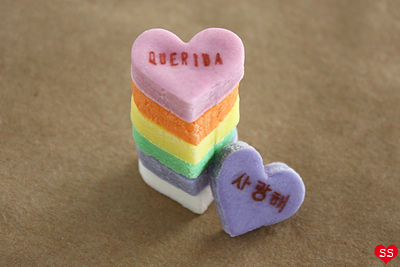 But these candies are totally fun because they're customizable in color, flavoring, shape, and message. 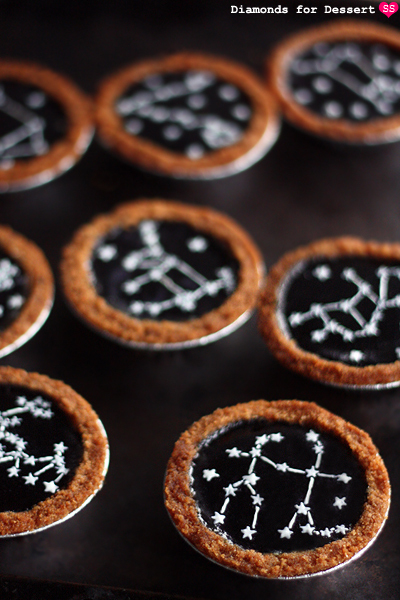 Plus, the recipe isn't too difficult. 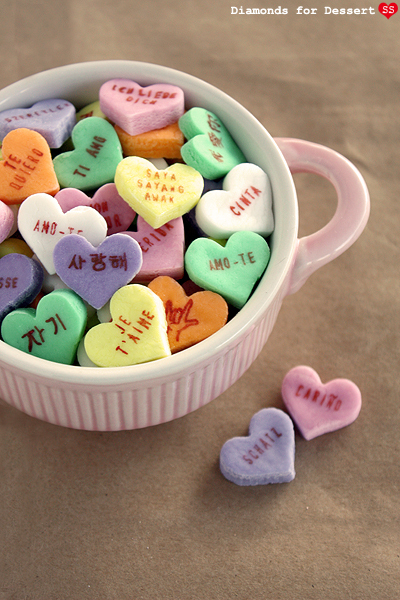 This would definitely make a great project for next Valentine's Day :).